Founded in 1877 as a mining camp, Tombstone became one of the most storied towns of the "Wild West." As one of the last frontier boomtowns in the United States, Tombstone prospered between 1880 and 1890, attracting cattle rustlers and outlaws. On the 27th (Wed), get engrossed in the history at Tombstone's Historama, don't miss a visit to Bird Cage Theatre, head outdoors with Sister Paranormal Investigators, then steep yourself in history at The Tombstone Epitaph, and finally do a tasting at Silver Strike Winery. To see ratings, traveler tips, photos, and more tourist information, go to the Tombstone trip planner . New York City to Tombstone is an approximately 14.5-hour combination of train, flight, and taxi. You can also drive; or do a combination of bus and taxi. Traveling from New York City to Tombstone, you'll gain 2 hours due to the time zone difference. Traveling from New York City in March, expect nights in Tombstone to be somewhat warmer, around 46°F, while days are much warmer, around 72°F. Finish your sightseeing early on the 27th (Wed) so you can travel to Las Vegas. 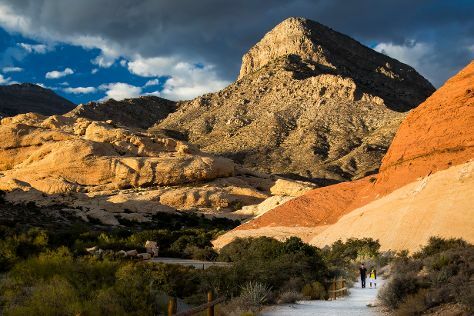 On the 28th (Thu), explore the wealth of natural beauty at Red Rock Canyon National Conservation Area, take in nature's colorful creations at Bellagio Conservatory & Botanical Gardens, and then admire the local landmark of Bellagio Fountains. For reviews, where to stay, maps, and more tourist information, refer to the Las Vegas travel app . You can do a combination of car and flight from Tombstone to Las Vegas in 4.5 hours. Alternatively, you can drive; or do a combination of car and bus. Due to the time zone difference, you'll gain 1 hour traveling from Tombstone to Las Vegas. Plan for somewhat warmer nights when traveling from Tombstone in March since evenings lows in Las Vegas dip to 52°F. Finish up your sightseeing early on the 28th (Thu) so you can travel to Grand Canyon National Park. On the 29th (Fri), get outside with Shoshone Point, explore the stunning scenery at Moran Point, and then explore the stunning scenery at Grand Canyon South Rim. Get ready for a full day of sightseeing on the next day: take some stellar pictures from Pima Point and then hike along Rim Trail. Traveling by combination of car and flight from Las Vegas to Grand Canyon National Park takes 4.5 hours. Alternatively, you can drive; or take a shuttle. Traveling from Las Vegas to Grand Canyon National Park, you'll lose 1 hour due to the time zone difference. While traveling from Las Vegas, expect a bit cooler days and colder nights in Grand Canyon National Park, ranging from highs of 57°F to lows of 23°F. Finish your sightseeing early on the 30th (Sat) so you can travel back home.